You'd pretty much have to be a Grinch to dislike this week's episode of Glee. And not any kind of camouflaged, Sue-like Grinch, either. But the true kind, the kind that detests anything remotely hopeful and happy related to this holiday. Indeed, I was afraid the show would pour on the sap to an unbearable level on "A Very Glee Christmas." But it kept things both light and sweet throughout the hour, using the belief of Brittany to represent the child-like innocence we all strive for around this time of year. Lauren requesting the foxy Puckerman, and sweet potato fries; Tina inquiring about the whereabouts of Asian Santa; Mike asking for Channing Tatum to "stop being in stuff." On the heels of a game-changing episode that shook up all relationships on the show, we didn't get a lot of follow-up, which is likely disappointing to many because this is the final new installment until Super Bowl Sunday. But the Rachel/Finn scenes did ring true, at least, as it's easy to see why the latter is so hurt by Rachel's actions. Does he not have anything negative to say to Puck, however, who was also involved in the cheating with both Quinn and Rachel? I also must comment again on the issue of bullying. Glee dedicated multiple episodes, and sent Kurt to a different group, all because he was threatened and insulted at school. But the football players openly throw slushees at the singers, and a teacher threw a frickin shoe in their direction... and there are no repercussions? Feels like a double standard and a lack of consistent storytelling to me. Still, it's almost Christmas. If Sue can get into the spirit, I can save my criticisms for another time. Overall, this was a fun, sentimental episode. 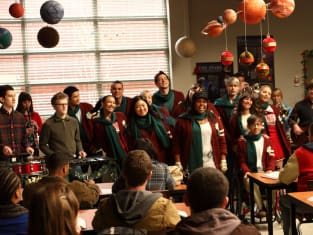 Beiste gave a great speech as Santa, Becky was prominently involved in mischief and Will considered getting Sue a robot dog or a soul as a present. What else can one ask for? One final question, though, before I turn this over to readers and ask for their take on "A Very Glee Christmas." Does the device Artie used at the end truly exist?